I needed to get a little yard work done before the first big storm came in; I backfilled a new wall (losing 2 lbs in the process), worked on the drip system, and mowed and fertilized the lawn. The weather came in on schedule – bringing lots of needed moisture and compacting the fill behind the wall – so I moved inside to pretend to be a studio photographer. It’s October so my lovely bride is getting out the Fall and Halloween decorations. They proved to be worthy subjects for my camera! A little background – when I was finishing my engineering degree (several decades ago), my lovely bride, Susan, was at home with 2 little boys. Between my working, going to class, and studying, we didn’t have much time for conversation. One of our neighbors in married student housing was a mechanical engineering student and his wife was in the same predicament. Susan and the neighbor wanted to have a night out, so they found a tole painting class. Susan was a natural and became a world renowned tole painter. For years, our home has been a revolving gallery of her work – the theme changing with the seasons. With the storm in full swing, I set up a little studio and made images of Susan’s work. I hope you enjoy her beautiful art and hope that I did proper justice to her talent. 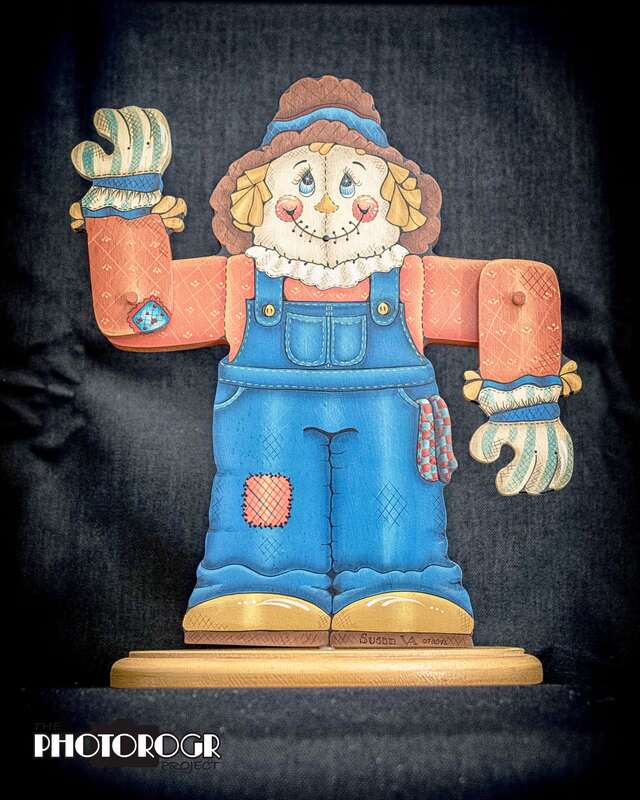 Except where noted, the figures are painted on 1/2″ plywood and the other pieces are cut from 1/4″ pine. 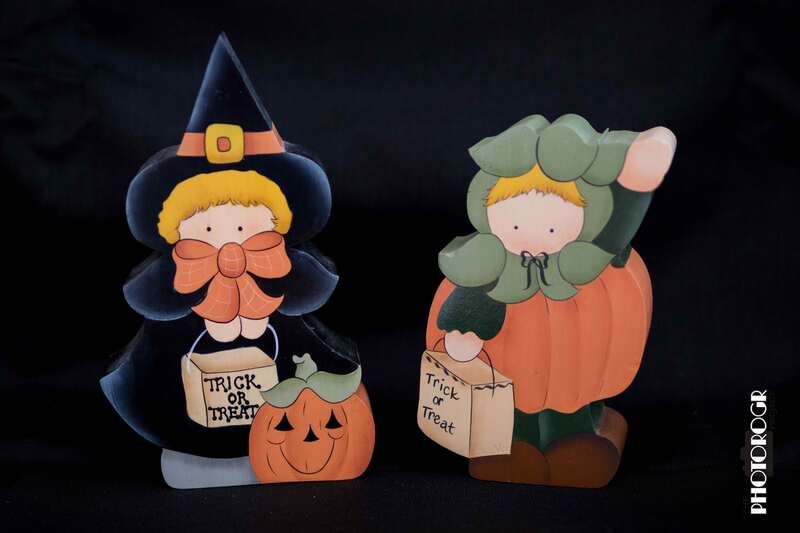 This pair of trick or treaters is painted on 1.5″ thick wood. 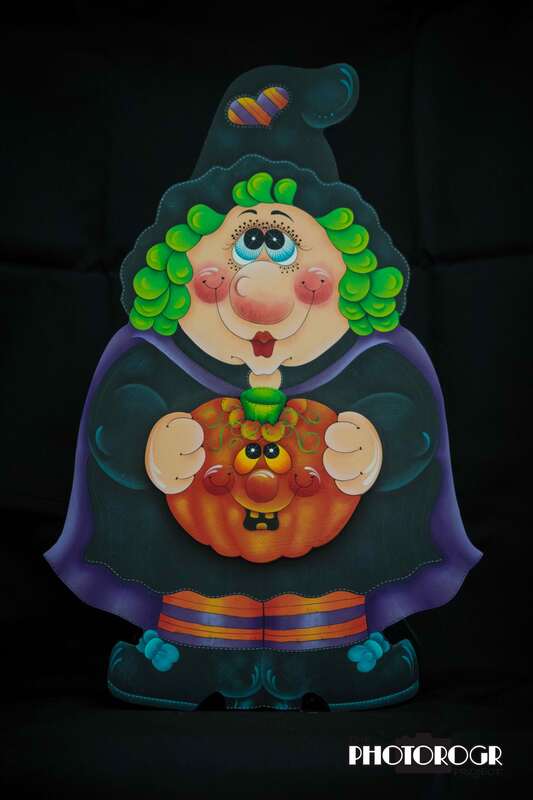 The Witch is about 7″ tall, and the Pumpkin is about 6″ tall. 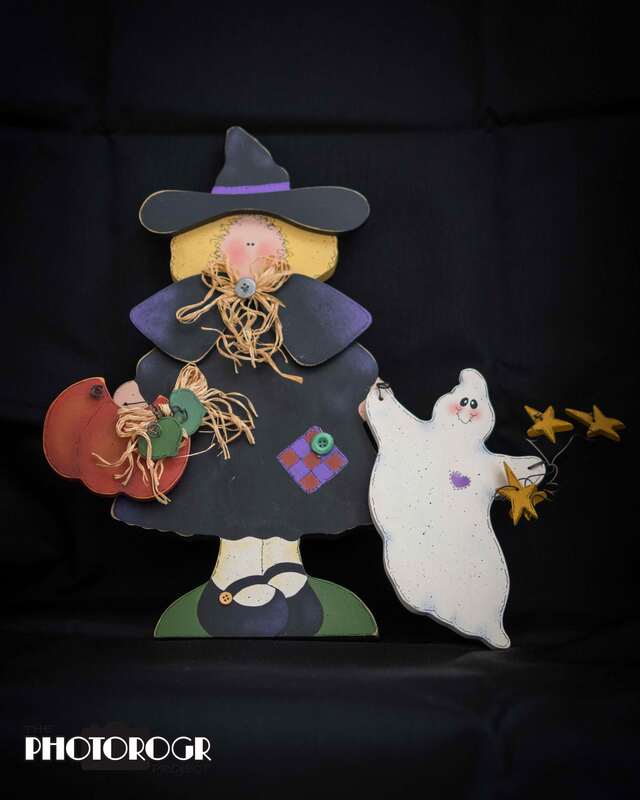 This little Witch is 18″ from the bottom of her feet to the top of her hat, and her Ghostly companion is almost 10″ tall. As with all her figures, Susan paints each piece individually and then assembles them. 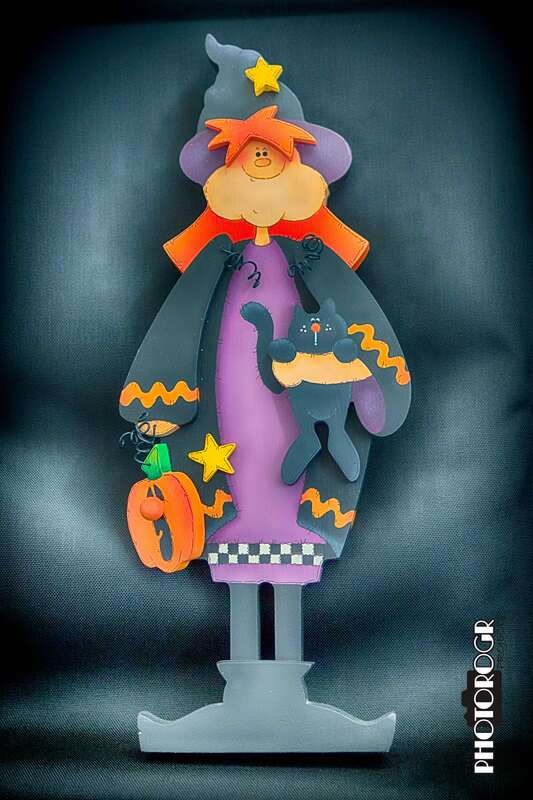 This beWitching lady stands about 24″ tall. 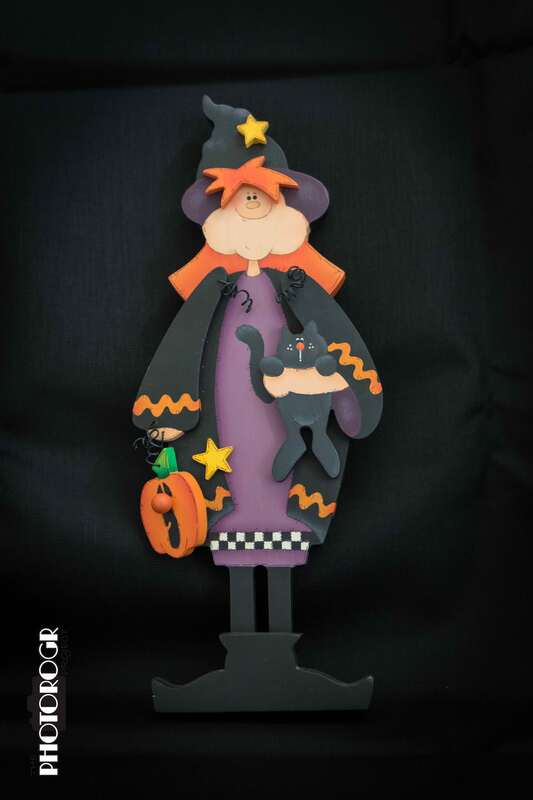 This lovely little Witch stands about 20″ tall. Her hands are made of 3/4″ pine, and the spider is 1/2″ plywood and 1/4″ pine. 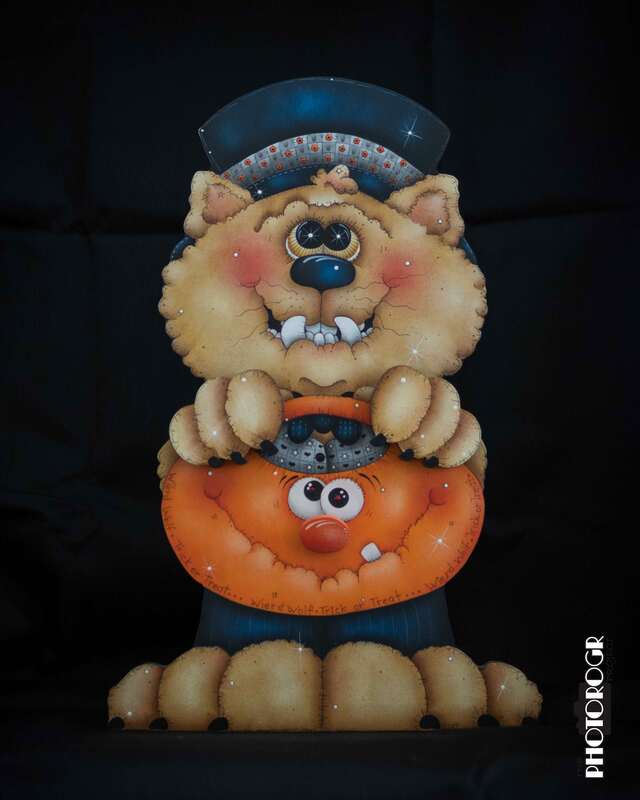 This little Wolfman also stands about 20″ tall. 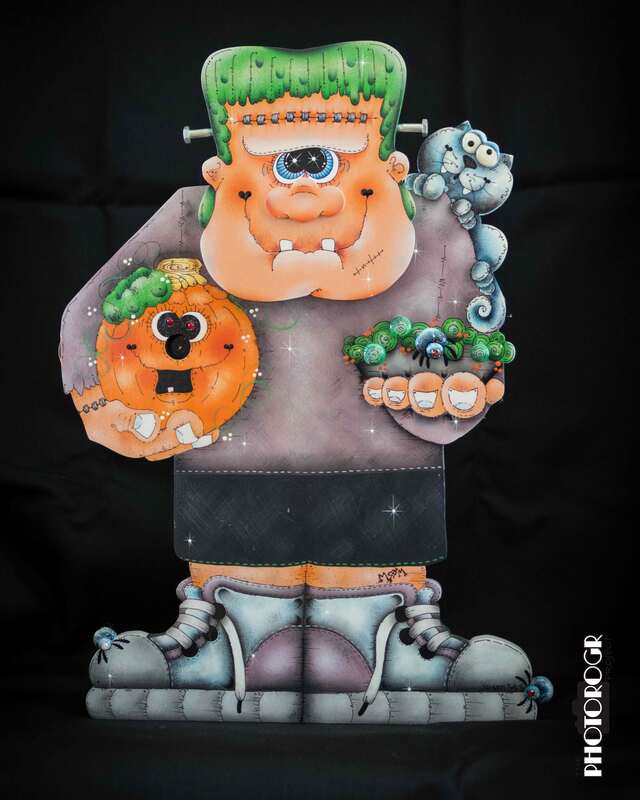 Halloween wouldn’t be complete without a Frankenstein monster, complete with charging posts. He stands about 22″ tall. This is our candy basket for the trick-or-treaters. The box is about 12″ square and 3″ deep. 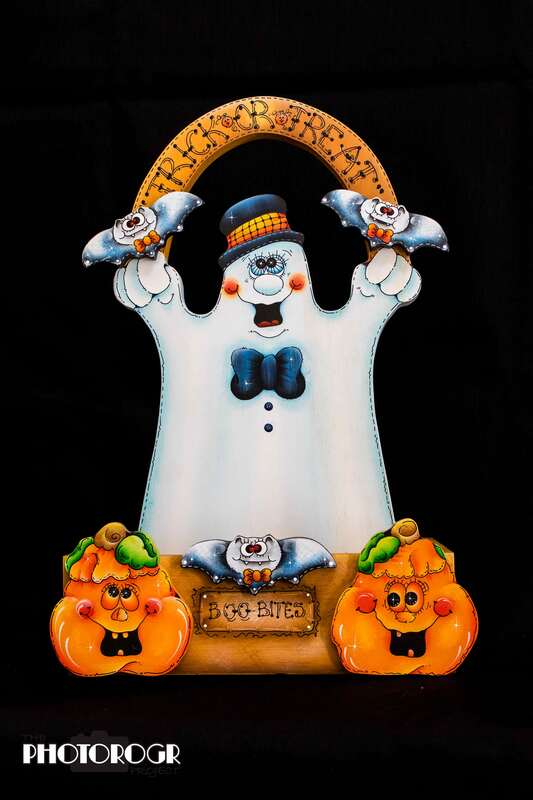 The welcoming Ghost is about 16″ to the top of the handle, and stands in the center of the box. This was my most challenging image, trying to get it all in focus. 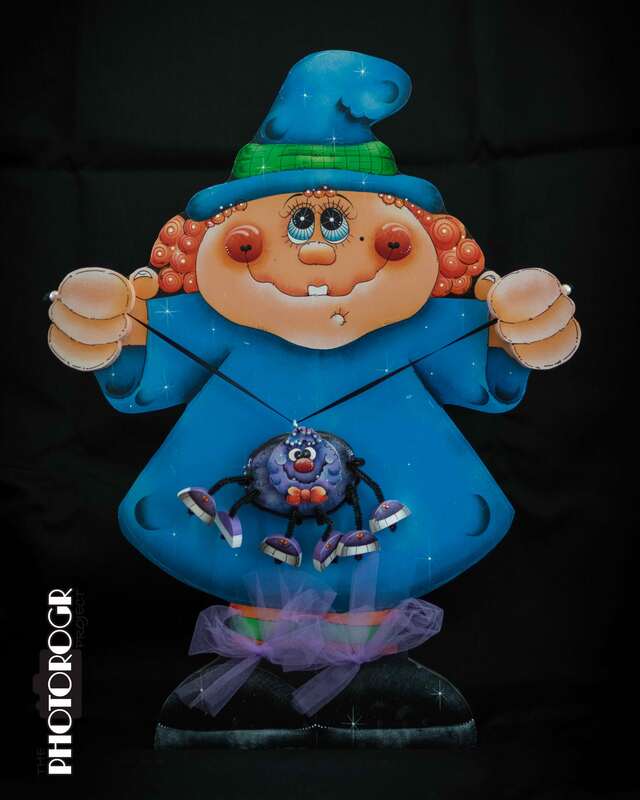 This Witch is about 16″ tall. I processed this image using different filters and techniques – always exploring! This Scarecrow guards our kitchen counter from intruders. He’s really good, because no unwanted crows are hanging around in there! He’s about 12″ tall. And, a little different processing makes a picture showing a different feeling. 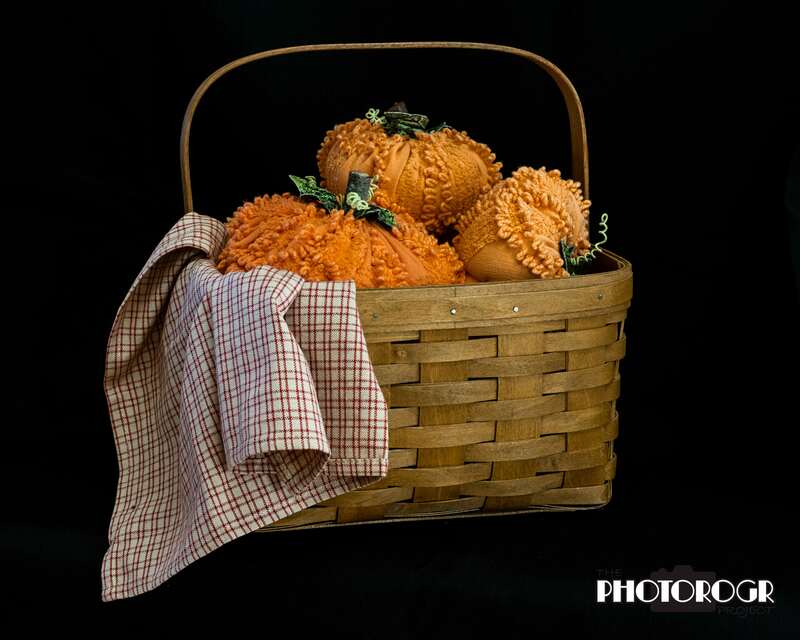 Susan also has a fun collection of chenille pumpkins and baskets, helping with that Autumn feeling around the house. 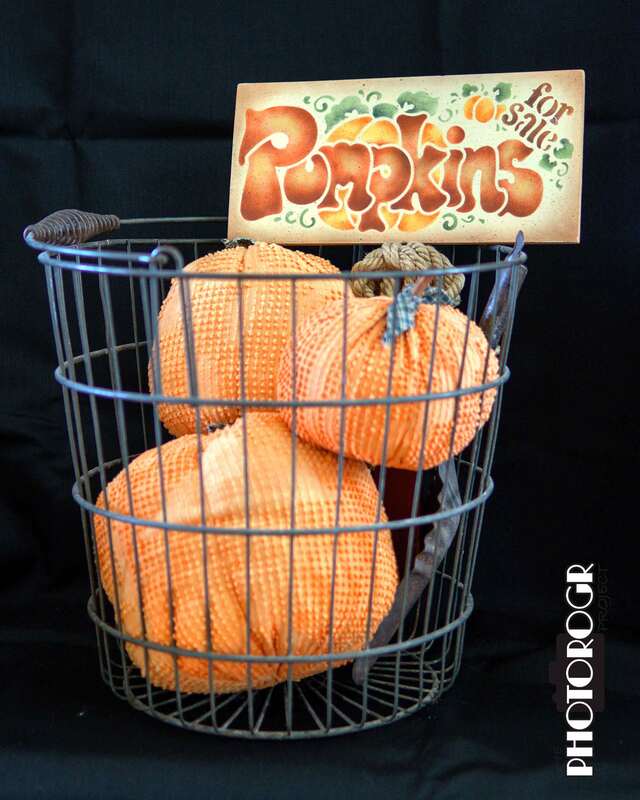 The sign says ‘Pumpkins for sale,’ but don’t believe it. Susan painted the sign as a decoration, not an advertisement. 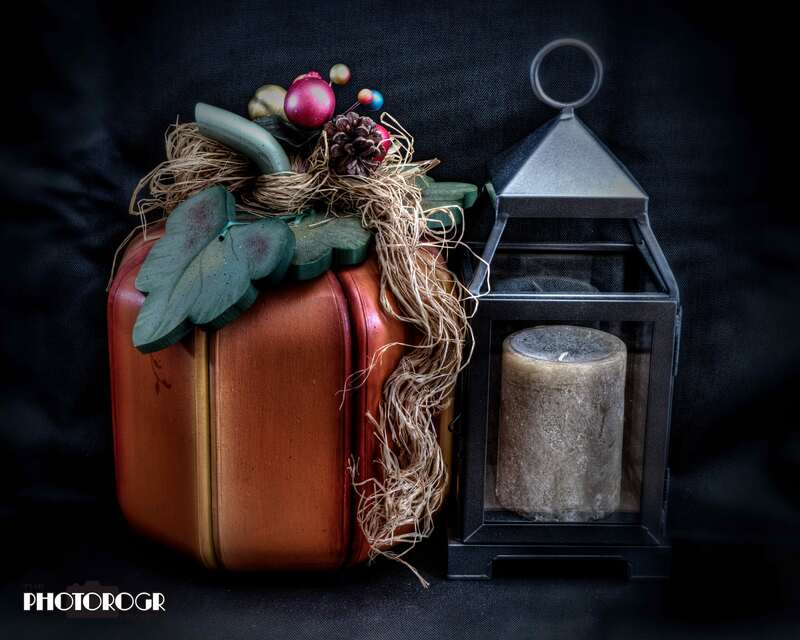 I experimented with another of Susan’s painted pieces, this Pumpkin, and a lantern. I found the lantern to be very challenging because of the glass door. In many shots, I had unwanted reflections (in several instances, the striped socks I was wearing) blocking the candle. I made this image using multiple exposures and assembled them in Photomatix, then applied filters in Nik Color Efex Pro. 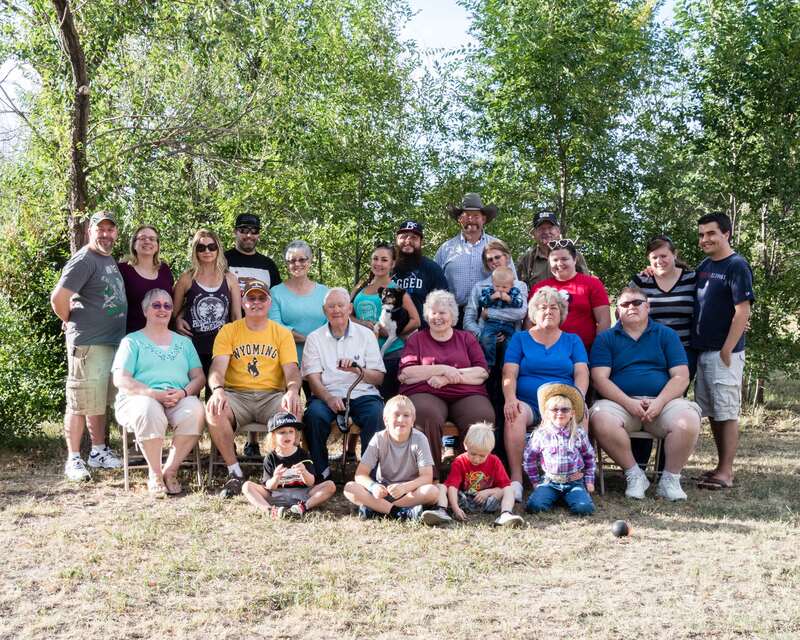 A couple months ago, my lovely bride and I loaded up and headed home to Wyoming to join family in celebrating my Dad’s 85th birthday! While we were there, we also celebrated Mom and Dad’s 65th wedding anniversary. (The anniversary actually happens in November, but we celebrated while we were all there!) I just realized that I haven’t shared our family portrait from the party. My lovely bride flew home the day after the party, so I was on my own for the drive home. The first photo stop on my trip home was going to be Rocky Mountain National Park, so I reserved a hotel room in Loveland CO (just downhill from Estes Park, the Gateway to RMNP, and about 1/3 of the price of a room up the hill). 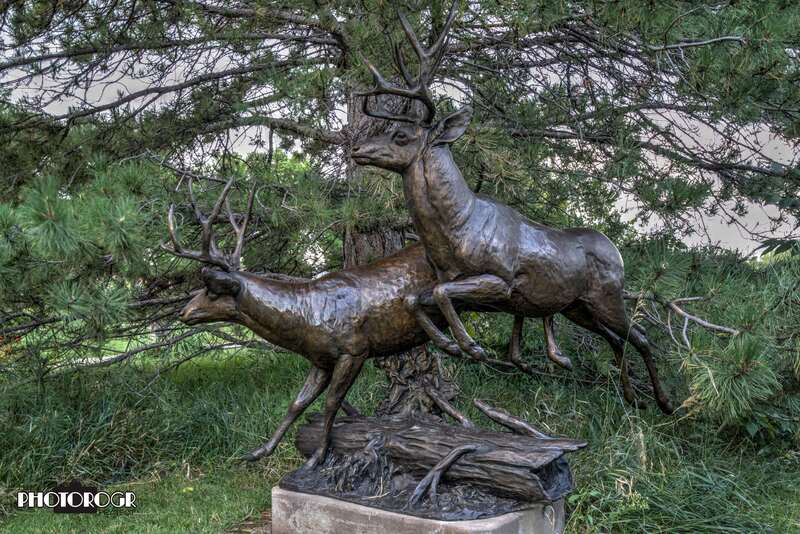 As I was driving to the hotel, I passed a brown road sign advertising the Benson Sculpture Gardens. 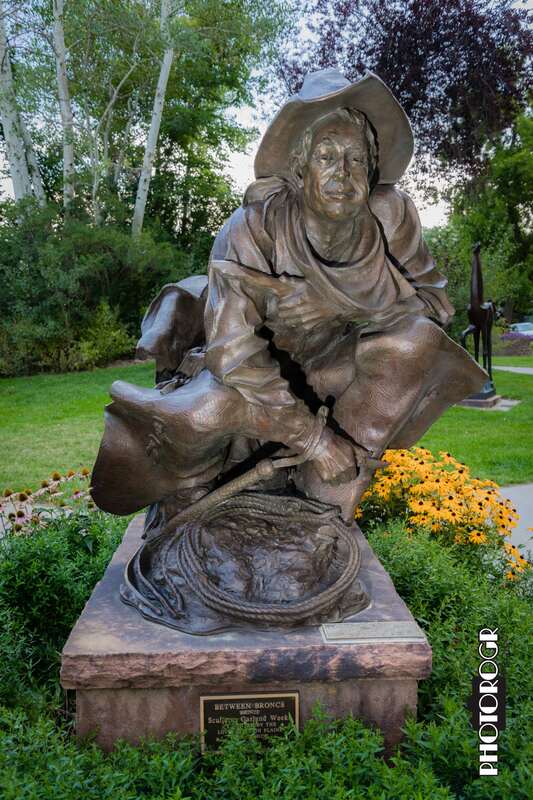 While I was eating dinner, I looked up the Benson Sculpture Garden on my phone (yes, I know a little about technology) and decided to check it out. The Garden is a huge park full of huge sculptures. I chose handheld flash, and found myself popping the flash from different angles and sides to see what the result would be. I had to work around all the people in the park – hundreds of them – all walking around looking at their phones. 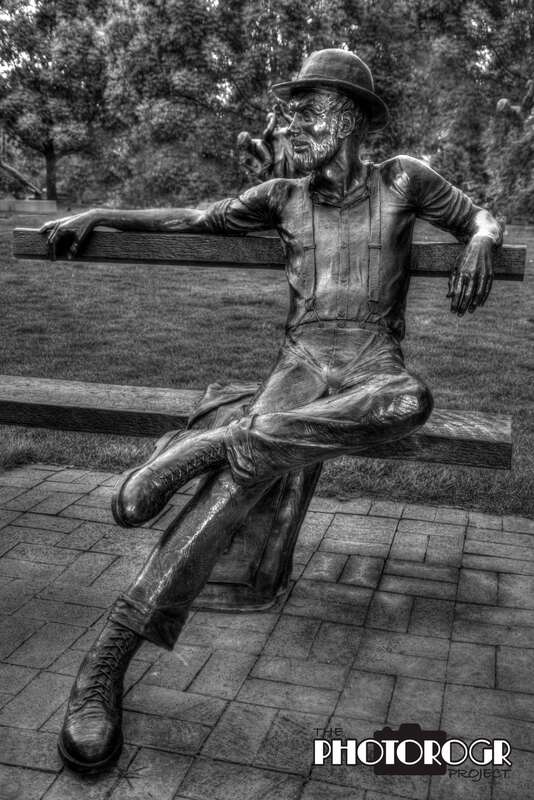 The Pokemon craze had just hit and it seemed that Loveland’s populace had embraced it fully – at least those who were in the Benson Sculpture Garden that evening! I’ve taken a very long time to finish these pictures. Sometimes, we try things in camera that yield good results easily, but some of them take more work. I look at this as a wonderful learning process. I need to push the limits of my equipment, but I also need to push the limits of my knowledge of photography and image editing. I succeeded in pushing the limits. Using these images made in camera, I learned a lot about editing images using multiple software packages and filters. 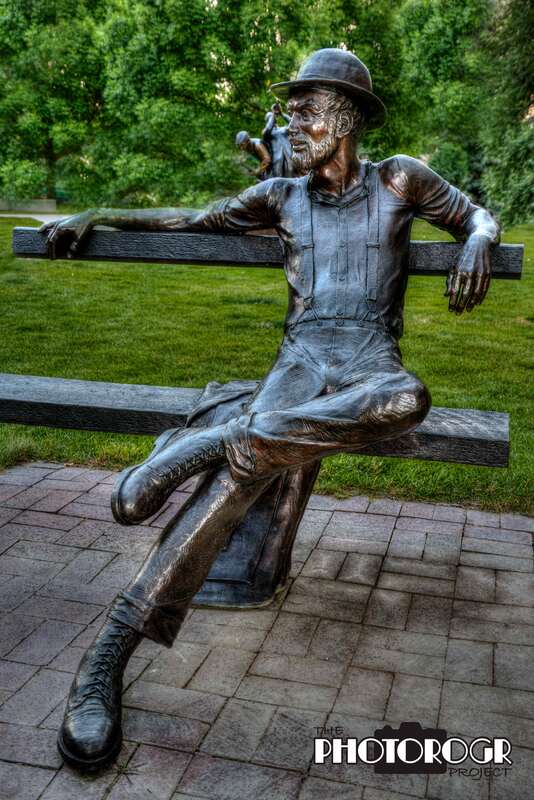 A BIG THANKS to all the artists who created these fantastic sculptures and put them on display, and to the City of Loveland for assembling them in this beautiful setting. I think you’ll like the results, so let’s get to the pictures! 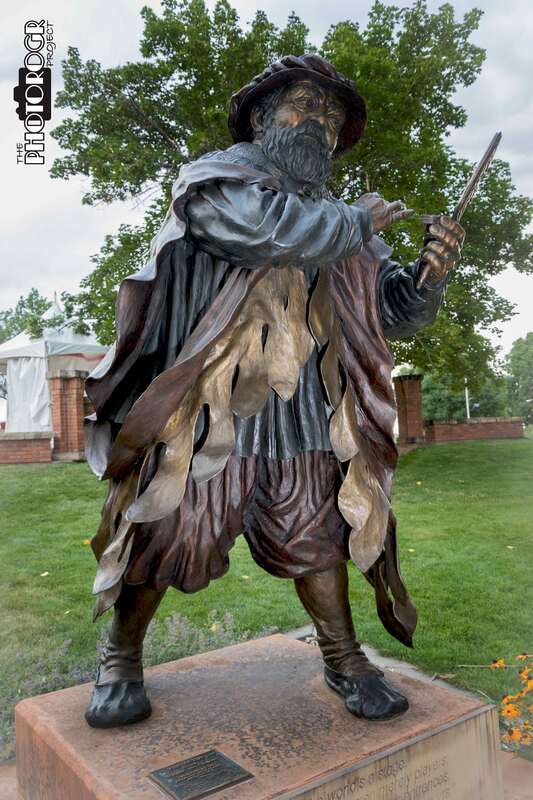 One of the first sculptures I saw – Shakespeare. 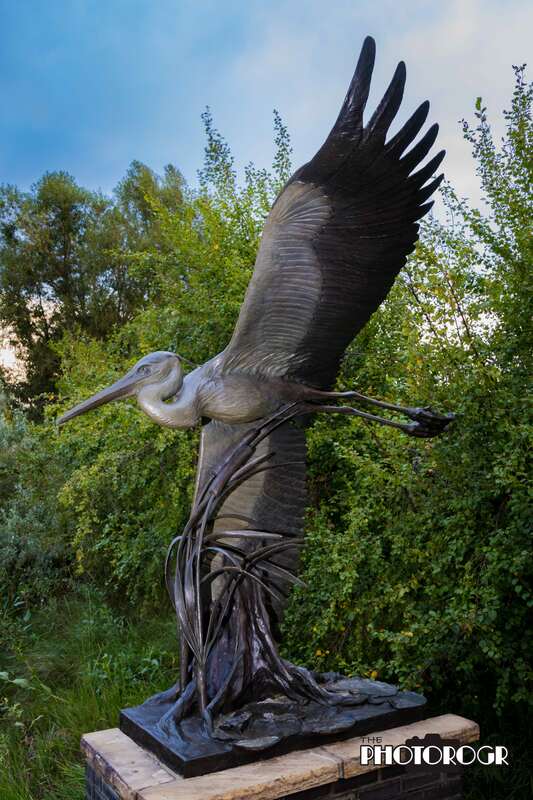 I tried to frame the sculpture with the tree in the background, but the sky still made this a challenge. I introduced a light vignette to bring the sky down a little. 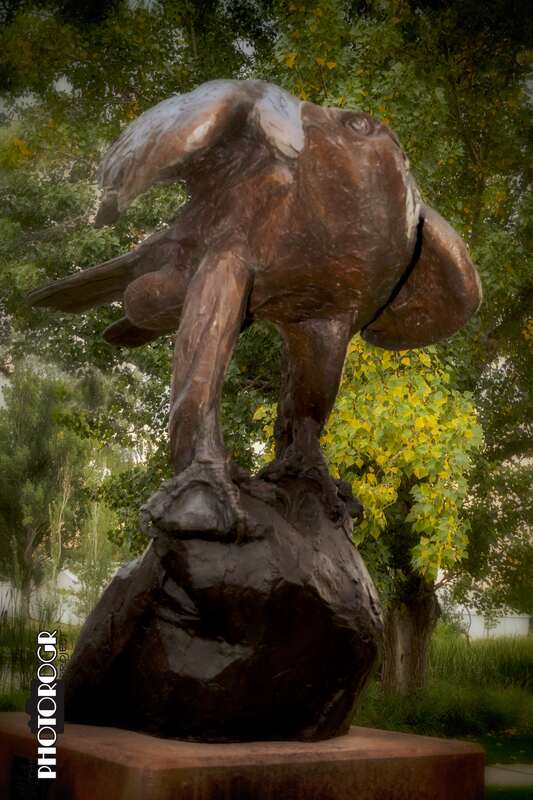 Probably not the best angle of this Eagle, but it’s the one I chose. I used a little fill flash underneath to negate the shadows. 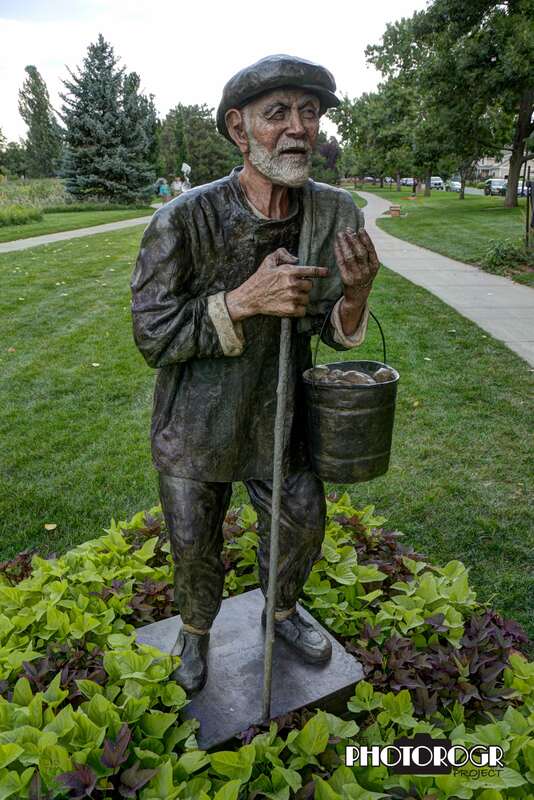 This sculpture is called ‘The Potato Man.’ It is one of my favorite sculptures in the Benson Sculpture Garden. I combined three images to bring out the colors and the details. 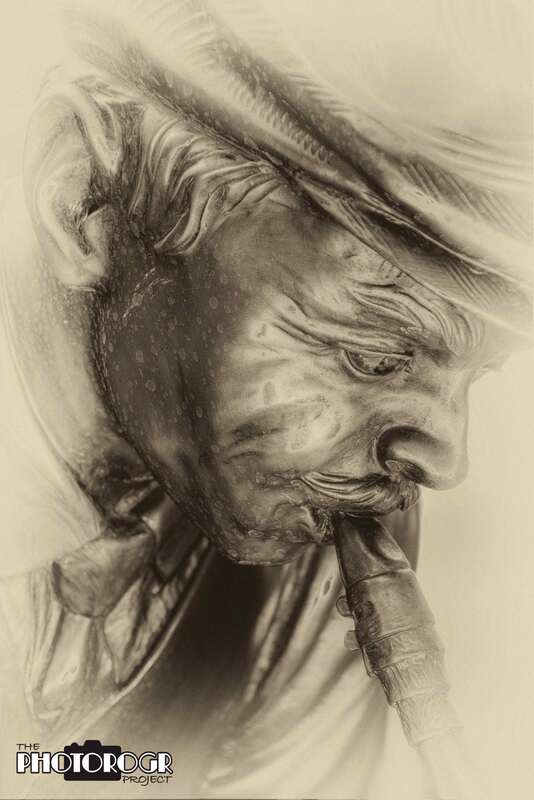 I made two images of this sculpture, using flash on both sides of the head. I then combined the two images in Photomatix to get this result. This is an HDR image, using 4 images with different exposures and flash placement. I applied a black and white filter and adjusted the contrast a little to make this version of the image. I like them both! 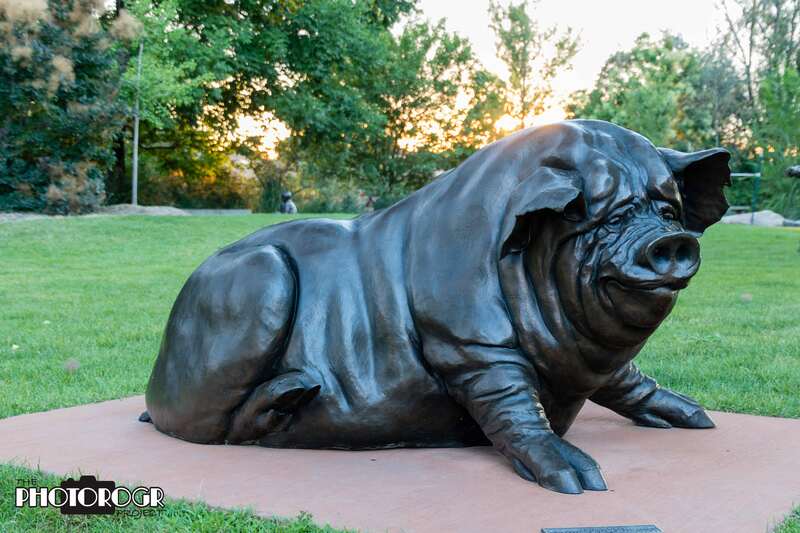 This sculpture was in shadow as the sun was setting behind and to the left. A little fill flash made the image work. 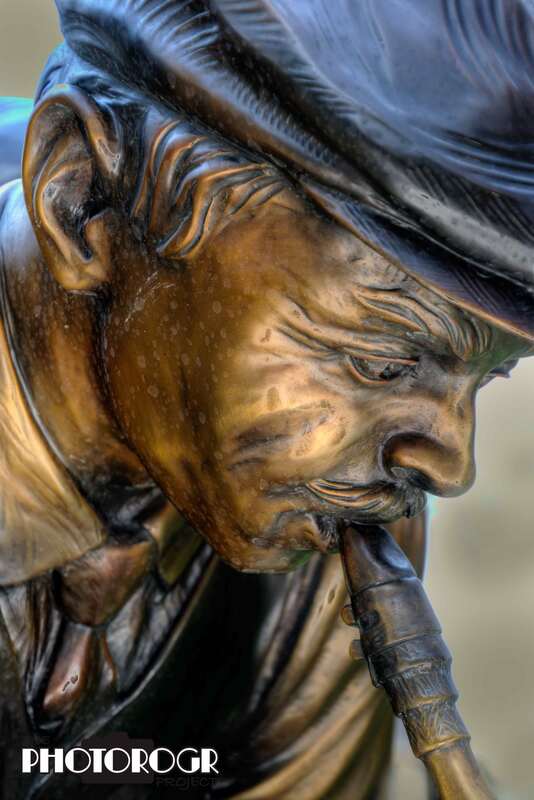 This is a close up of the saxophone player. I combined three images in Photomatix to make this image. I applied a preset filter in Nik Silver Efex to make this image. Some people would say, ‘…make it stop!’ Filters can be overused, but I had to share one more using this preset from Nik Silver Efex. 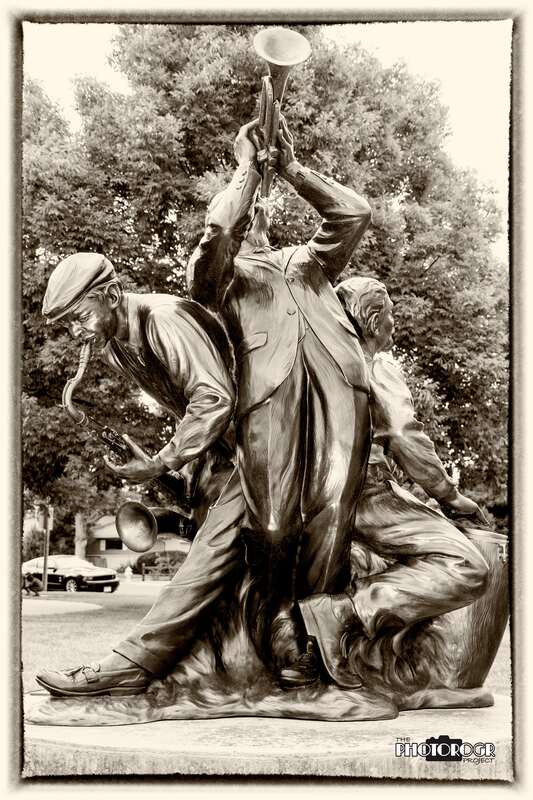 This is the drummer from the other side of the musical trio statue. Ah, the fun of being young! 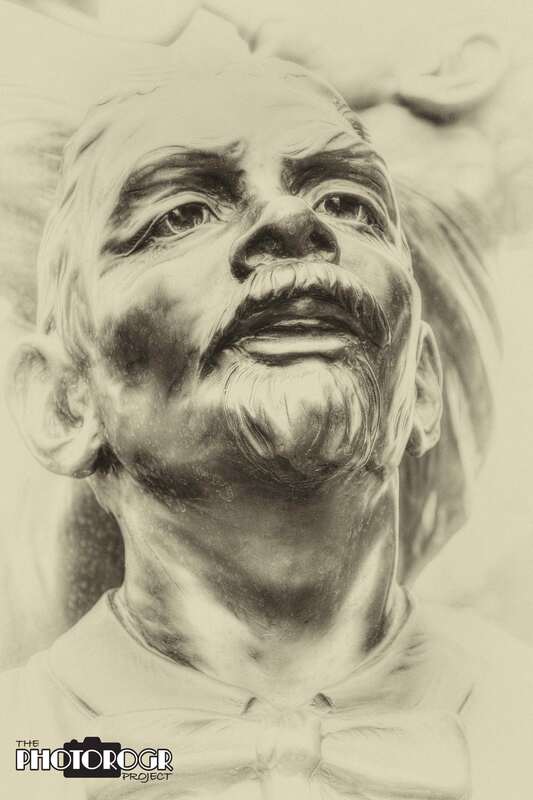 My Mom has a Christmas ornament based on this sculpture. 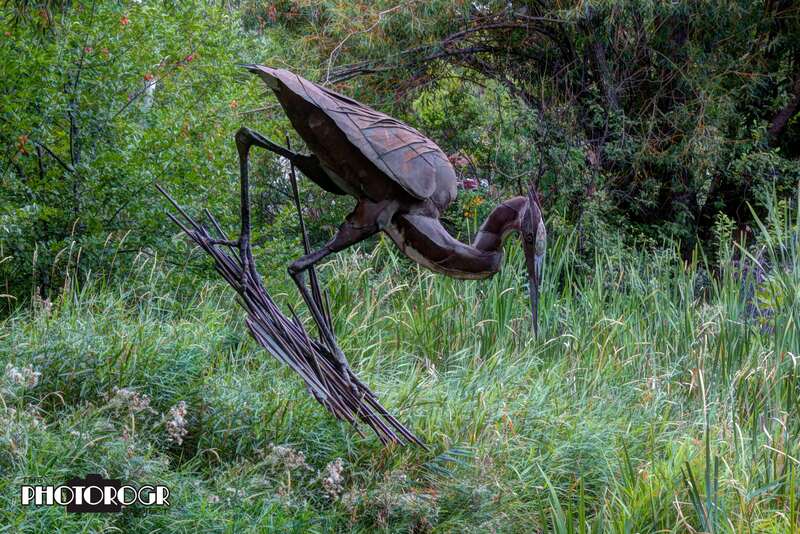 This sculpture is in a beautiful and natural-looking setting. I removed the concrete pedestal to improve the natural look. Another of my favorites. 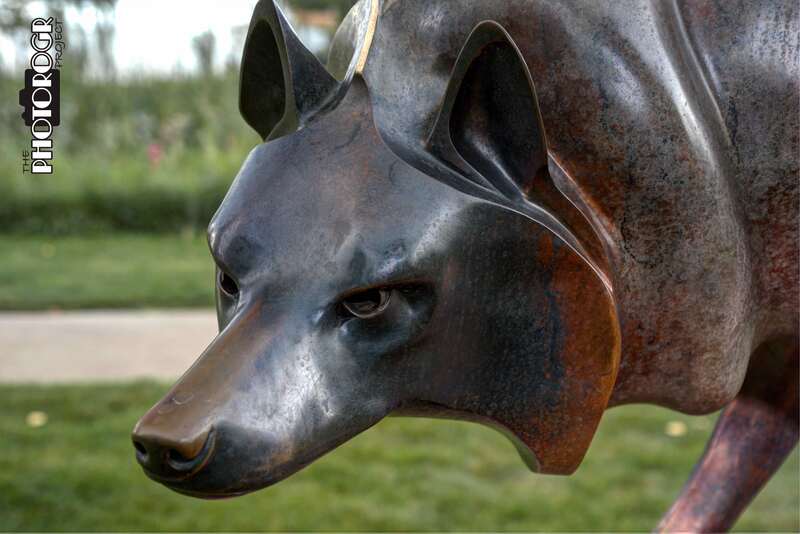 I used a fill flash to make this side of the sculpture visible. A couple of bucks running through the woods! There are visual treasures at every turn! 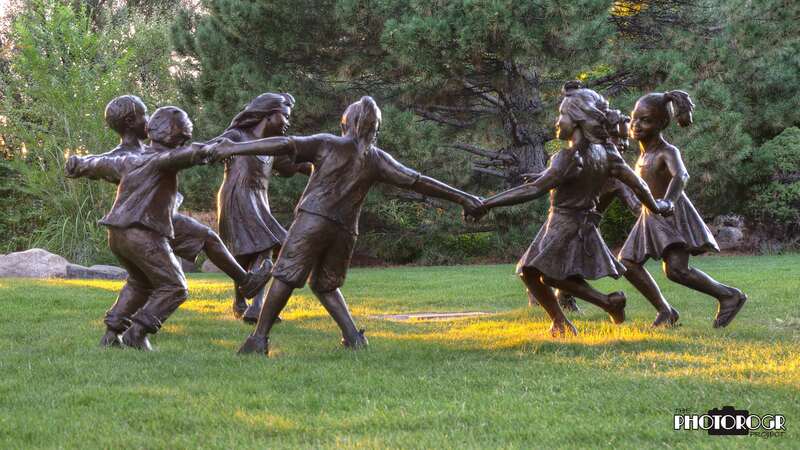 These kids were really enjoying the park. This is a composite of three exposures. So, there you have it. 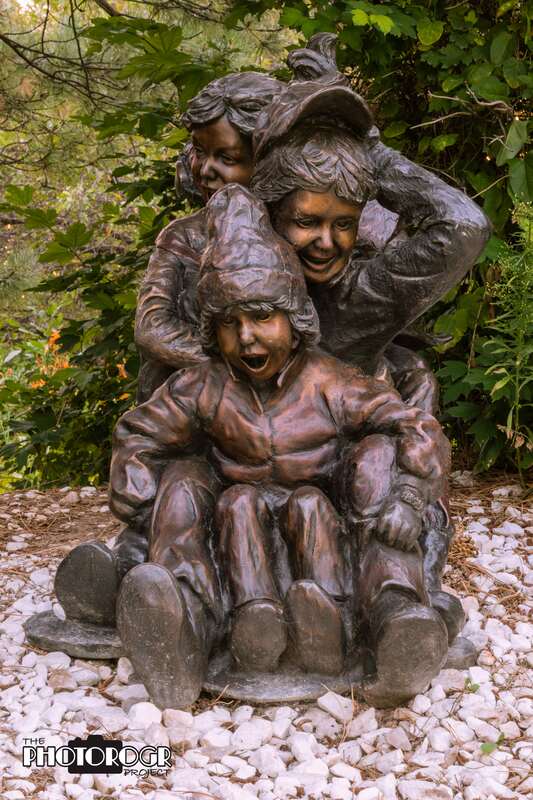 These are but a few of the sculptures in the Benson Sculpture Garden. I’ll return another day, armed with better knowledge of photography, to make more images of this wonderful place. If you’re planning a trip to this area, this is a must see. If you’re on a journey in creative photography (like I am), this is a great place to learn your craft!